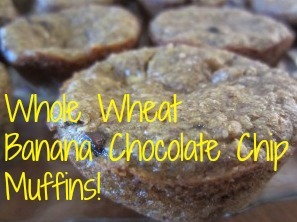 Whole Wheat Banana Chocolate Chip Muffins Recipe! You are here: Home / Recipes / Breakfast / Whole Wheat Banana Chocolate Chip Muffins Recipe! Bananas can often be found on markdown in the produce department. I never hesitate to buy the marked down bananas since they are perfect for muffins, smoothies or freezing for future use! These muffins are loaded with protein and fiber for a healthy breakfast or snack! Preheat oven to 350 degrees F. Coat 24 muffin cups with nonstick cooking spray. Puree peaches and bananas in a food processor. Place pureed fruits, egg whites, oil, sugar, brown sugar, and yogurt in a mixing bowl. Beat with electric beaters or by hand until smooth. In a separate bowl, mix flour, wheat germ, flaxseed, baking soda, baking powder, and salt. Pour dry ingredients into wet ingredients and beat just until well blended. Bake for 20 to 25 minutes, or until a knife inserted in the middle comes out clean. Makes 24 muffins that freeze well & are loaded in protein (5g) & fiber (2.8g) for a healthy breakfast or a pick-up & go snack! You can substitute other fruit for the peaches. Try canned mandarin oranges if you don’t have peaches on hand!